Brazetek offers a complete line of quality, compact, efficient and low cost brazed plate heat exchangers (also known as water to water heat exchangers) for a wide range of water to water and liquid to liquid heat transfer applications. 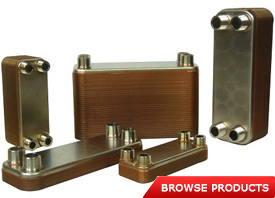 The state-of-the-art design of the Brazetek brazed plate heat exchangers (BPHE's) allows them to operate at extreme temperatures and high flow levels with minimal pressure drop, providing the highest thermal efficiency in a most compact design available. All Brazetek BPHE's are UL listed, pass rigorous quality control and are designed to meet and exceed industry standards making them a competitive replacement for similar products from other manufacturers. 3"x8" (3/4" NPT), 4"x12" (1" MNPT), 5"x12" (1-1/4" MNPT), 10"x20" (1-1/2" or 2" MNPT). 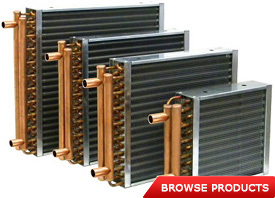 Brazetek sells a wide selection of lightweight, durable and highly efficient finned coil heat exchanger models (also known in the industry as water to air heat exchangers) used primarily for residential and light commercial forced air heating and cooling applications. Utilizing the industry-leading engineering tools and state of the art manufacturing equipment, Brazetek water to air heat exchangers are produced to offer optimal performance at various air and liquid flow rates and temperatures. From stamping and spacing of aluminum fins to positioning of copper coils, copper brazing process and outer casing assembly – Brazetek’s attention to critical details makes these units second to none in quality, craftsmanship and design. Various sizes from 12"x12" up to 24"x24" with 3/4" or 1" copper tubing inlets. Brazetek carries an extensive selection of shell and tube heat exchangers - ST series are all-316L Stainless Steel models and STX series are all-Titanium models. 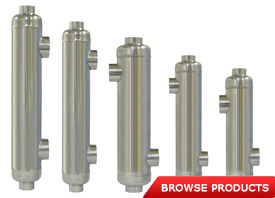 These water to water heat exchangers are suitable for processing a wide range of fluids, including water (ST for chlorinated pool water, STX for salt water and marine), dairy, glycols, hydraulic oil, chemicals and many others. Although most commonly used as swimming pool heat exchangers, Brazetek shell and tube heat exchangers can be utilized in projects such as solar and radiant floor heating, snow melting, oil cooling, heat recovery and others. Helically corrugated tube bundle inside the heat exchanger optimizes heat transfer between fluids and is more efficient comparing to non-corrugated tubes. BTU ratings from 55 to 1,200 KBTU and connection sizes from 3/4" up to 2" FNPT.